GreenEarth solution is safe for the planet, for dry cleaning, and for people. Here at Fabricare Center we are proud to say that we use GreenEarth solution. As a company and as individuals we are environmentally conscious. We are focused on taking the necessary steps towards helping the environment while making our customers happy. GreenEarth is “a kinder clean.” They “seek to take better care of fabrics, the people who wear them, and the planet where we live.” At Fabricare Center, we agree with their mission and are happy to say that we use their products. GreenEarth is great for so many reasons. Here are a few of our favorites. Nose friendly:­ The solution is clear and has absolutely no odor, so your clothes smell fresh and clean, not “dry cleaned.” You are left with no chemical odor. Skin friendly:­ You can even rub the solution on your skin. The process uses pure liquid silicone, the same base ingredient found in everyday shampoos, conditioners, skin lotions and antiperspirants. No worries. GreenEarth is non-­allergenic and non ­irritating. Clothes, and skin, just feel good. People friendly:­ GreenEarth is safe to work with, safe to dispose of and safe to breathe.You don’t have to worry about chemicals harming the planet or us. Fully tested:­ Over $30 million dollars of voluntary testing and research has been done to confirm that this solution works. Some worry that this solution isn’t as strong as others, but rest assured this solution will leave your clothes feeling clean and fresh. 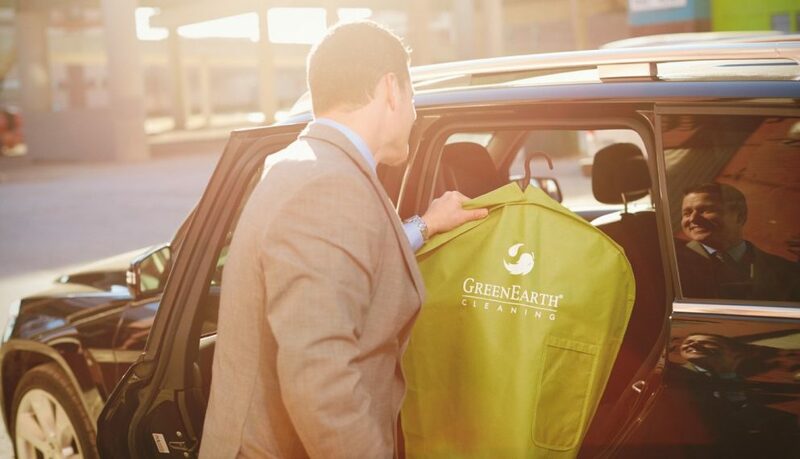 GreenEarth is not used by everyone, there are less than 20 registered Dry Cleaners in the Atlanta area that are certified to use the GreenEarth products. We are proud to be one of them. So, next time you are deciding on a new Dry Cleaner check and see if they are using GreenEarth products or potentially harmful chemicals. For more information on GreenEarth, check out their website https://www.greenearthcleaning.com or come by one of our locations and we’d love to chat about it. Fabricare Center: Dunwoody Pickup and Delivery Dry Cleaning Service! Fabricare Center: Sandy Springs Pickup and Delivery Dry Cleaning Service! Fabricare Center: Brookhaven Pickup and Delivery Dry Cleaning Service! Dry Cleaning Tips and Tricks! Copyright text 2017 by Fabricare Center.